Having looked at some of the valuable information you can find through the data captured by Google Analytics, we wanted to take a beginner’s look at Google Webmaster Tools (GWT) – the more technical companion to Google Analytics – which is a must-see for anyone serious about tracking their SEO efforts. If you don’t have access to Google Webmaster Tools already, your first step is to set it up. 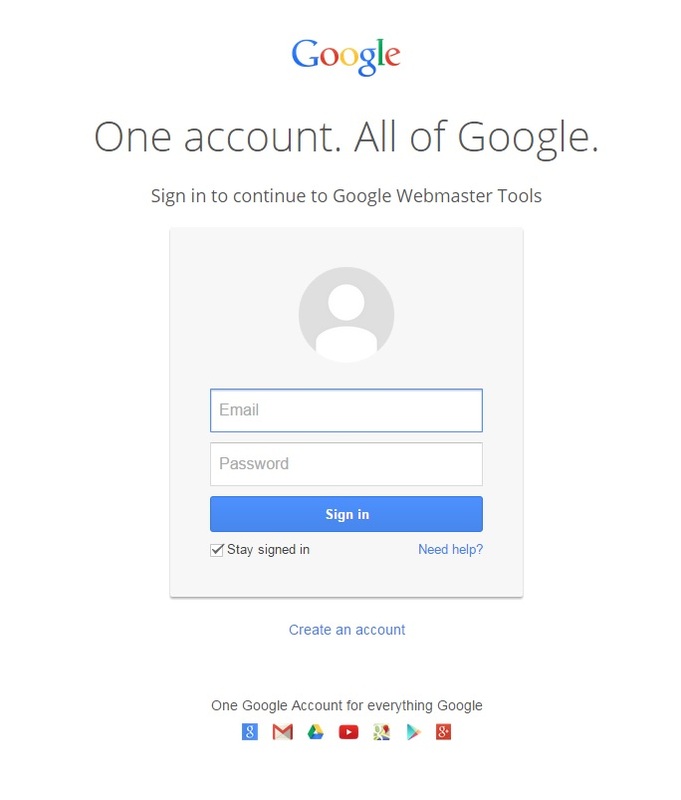 Go to Google Webmaster Tools at https://www.google.com/webmasters/tools/ and log in with your Gmail account (you should have this if you have already set up Google Analytics). You’ll be taken to the Google Webmaster Tools dashboard where, near the top right-hand side of the screen, you’ll see a red ‘ADD A SITE’ button. Click on this and a pop up message will appear, asking you to add your site’s URL. Type in your URL and click ‘Continue’. You will now have to verify that the site is yours. There are several ways to do this – Google Webmaster Tools can give you a piece of HTML code to add into your site or you can click the ‘Alternate methods’ option and choose the ‘Google Analytics – Use your Google Analytics account’, which we think is easiest if you already have Google Analytics set up as it uses the same tracking code. If you are set up as an Administrator on Google Analytics, you simply need to click ‘Verify’. Once you have verified your website, it can take a couple of days for data to begin appearing in Google Webmaster Tools. You can check the verification by clicking on the little ‘Settings’ cog icon to the top right-hand side of the screen and choosing ‘Verification details’. Once your website is verified in GWT, you should create and submit a site map, as this tells Google what pages you have on your website that you would like it to crawl. There are lots of different ways to generate a site map (we found a great post over at Wordtracker, which covers many of your options). If you have a WordPress site, you can create an XML sitemap using the fantastic Yoast WordPress SEO or a dedicated XML sitemap plugin, such as Google XML Sitemaps. Once you have generated a site map, choose the ‘Sitemaps’ option in the third column of your Site Dashboard in GWT and click on the red ‘ADD/TEST SITEMAP’ option. Paste the portion of the sitemap URL that comes after the http://www.domain.com/ bit into the pop up box. You can choose to ‘Test’ the sitemap to ensure that there are no problems or to go straight ahead and ‘Submit’ the site map. Again, it may take a couple of days for GWT to start showing your data. On your Site Dashboard, you’ll notice that the main menu runs down the left-hand side. You can also see at a glance whether Google has flagged up any critical issues with your website, crawl errors, a snapshot of how often your website has appeared on SERPs over the past 30 days and the number of clickthroughs, as well as the number of pages indexed by Google. In the picture above, we can see that there are no critical errors but that there are 30 categories and pages not found. Not found errors (404 pages) won’t cause Google to penalise your page but it’s a good idea to customise the message people see when they arrive on a ‘Not found’ page on your site – you can add some personality, humour or helpful information, as well as a link to your Home page, so you keep visitors browsing instead of navigating away. You can click on the grey headers, ‘Crawl errors’, ‘Search queries’ or ‘Sitemaps’ to access more detailed data and information. If there is a critical problem with your site or something Google feels you need to action straightaway, you will receive a message under the Site Messages option in the main navigation menu. 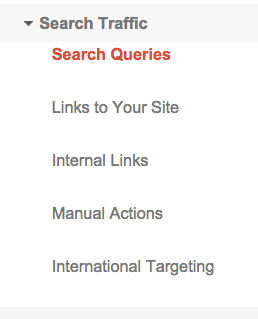 For example, when your site is successfully linked to Google Analytics, it will appear here. The options under the main Search Appearance menu are designed to show you how your different web pages appear in searches. Google offers loads of really useful tutorials related to this section. If you click on the ‘i’ information icon next to ‘Search Appearance’, you will see the screen above featuring the different elements that frequently appear in SERPs. You can click on each individual element – for example, the ‘Title’ or ‘Snippet’ – and Google will give you links to more information about creating an SEO-friendly title tag or meta description. Structured Data is quite a complicated topic and Google’s help pages already assume a certain amount of knowledge. Essentially, structured data helps Google understand the content of your website in a structured way, so that it can return the most relevant information in search results; it helps show whether a page is a product listing, event, blog, review, recipe or something similar. Structured data also means information can be nested within other items. For example, you might have a page about a forthcoming event on your website and feature a nested piece of information about the organisation running the event. On a blog page, your information as an author will be embedded or nested within the page, as well as any comments from readers. 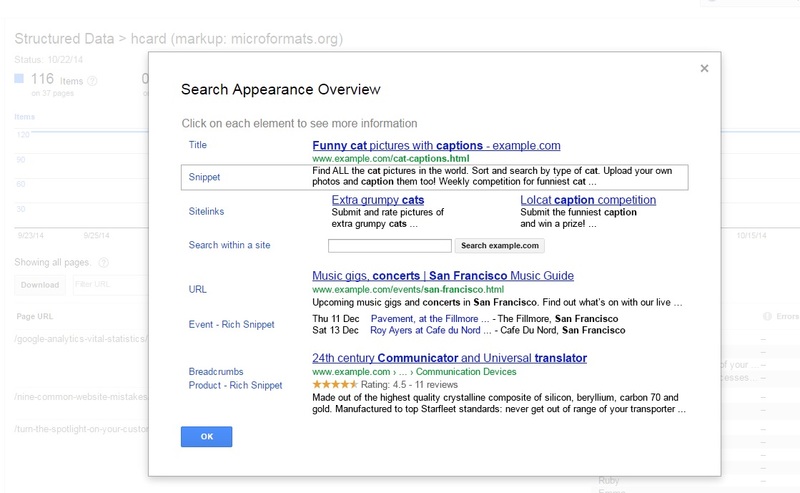 The Structured Data markup helps Google decipher all this information. As this is just a basic guide to Google Webmaster Tools, we’d recommend you read more about Structured Data, Rich Snippets and the Data Highlighter when you next have an opportunity to spend some time exploring GWT. One tool we would like to highlight is HTML Improvements, which will flag up whether you have duplicate page titles and meta descriptions that could be affecting how your website is listed in rankings. As a rule of thumb, duplicate data is a bad idea and, if possible, every page of your website should have a unique focus keyword, title tag and meta description. The Search Traffic section of GWT is where you’ll find a lot of valuable information in terms of tracking your SEO efforts. In fact, this is the section we use the most. If you click on the ‘With change’ option, you can see whether each of these statistics has gone up or down. If you suddenly see loads of your pages dropping significantly in rankings, it could be an indication that your website has been penalised by Google. Equally, if many of your pages take a big leap up, it could be a sign that your site has been positively affected by the latest algorithm tweak. You can click on each keyword listed in the left-hand column for deeper information about which pages were seen in SERPs for that search term and how often they appeared at different positions, as well as how that position affected the clickthrough rank. This is useful for seeing whether pages are ranking well for their focus keywords. The Links to Your Site option is a helpful tool for identifying backlinks to your site. This gives you some great insights into who is sharing, liking and linking to your content. You may decide to look at opportunities for guest blogging and relationship building. You can also explore the Internal Links on your site to check that you are providing the best possible internal navigation for your customers. If you manage one or more websites aimed at users in a specific country or who speak a specific language, the International Targeting section of GWT will help you ensure that search results show the relevant language and country version of your pages. The options under the Google Index menu will show you how many pages Google has indexed and the Content Keywords that Google recognises as most relevant to your website. This gives some insight into how Google is interpreting your site. If unexpected and unrelated keywords suddenly appear in this list, it might be a red flag that your site has been hacked. If expected words are missing from this list, it’s worth checking for crawl errors. Google sometimes removes what it considers to be common words from the Content Keywords list. The Crawl menu will let you explore crawl errors in greater detail and see how Google is crawling your site. The little ‘?’ icon against many of the options will explain the data you’re seeing in more detail. When you have a spare moment, it’s worth spending some time exploring the Other resources menu. Through this, you can test the structured data for your site and/or get help with your structured data mark-up. You can also click through to Google Places to ensure your Google Places for business page is set up properly and appearing in search results. Another very helpful tool is the PageSpeed Insights, which will show you how quickly your website loads on mobile devices and on desktops, as well as listing problems and suggested fixes. Way back in 2010, Google’s Matt Cutts announced that page speed would be one of over 200 signals that Google uses to determine page rankings. Ideally, your website should load in three or less seconds. A slow load time can lead to a poor visitor experience and encourage people to navigate away from your website. With more and more of us viewing websites via our smartphones and tablets, Page Speed is becoming increasingly important. So, do you use Google Webmaster Tools yet? How helpful do you find it? What data do you keep an eye on? We’d love to hear your experiences or how you get on after setting GWT up.